Ticks are dangerous parasitic creatures that can lodge themselves into your cat's fur and into its skin. Besides just being gross, they can also carry several life-threatening diseases that can affect both you and your cat, including Lyme disease, tularemia, and Rocky Mountain Spotted Fever. 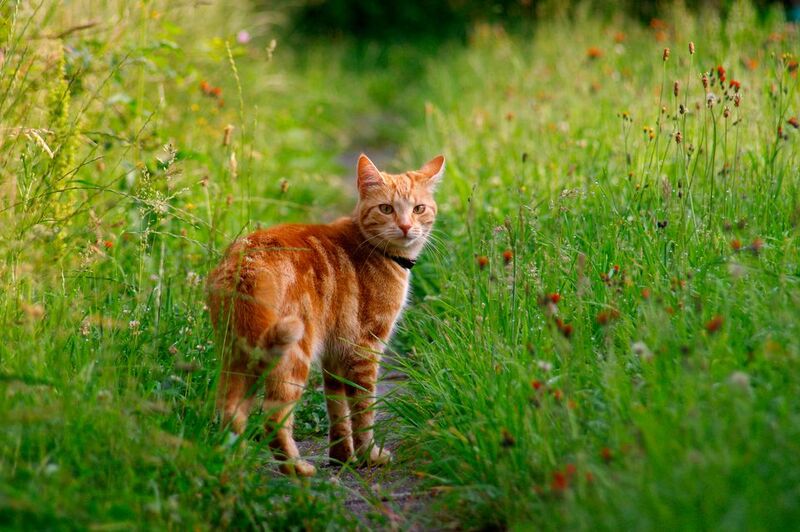 It is essential to remove any ticks you spot on your cat's skin quickly and efficiently to minimize harm to your cat. If you remove the tick within 48 hours of it taking up residence on your pet, chances are good that the cat will not become sick at all. Don't use flammable liquids or ointments to try to get rid of a tick (more on this below) because it won't work and may make matters worse. Instead, use this proven method to safely remove the tick. Since ticks are very common, it's helpful to keep essential supplies on hand, including sharp-nosed tweezers, a small jar of rubbing alcohol, a disinfectant spray or creme, and surgical gloves. To minimize any chance of hurting your pet, having a partner to help hold him can help a great deal. Use a comb to part the hair to expose the tick as much as possible. Using the tweezers, grasp the tick at the head, right where it enters the skin. Do not grab the tick by the body; if you do, you can break the tick in half, leaving its head embedded in the skin, where it can still inject your cat with toxins. Pull the tweezers steadily and firmly outward, without twisting or jerking. A smooth upward motion will ensure the tick comes out whole, without breaking apart. Place the tick in the jar of alcohol to kill it. Swab the cat's skin around the bite wound with a disinfectant. Spray the area with the hydrocortisone spray to help alleviate irritation and itching. If Lyme disease or other ailments are prevalent in the area, do not throw the tick away or flush it down a drain. Instead, take the tick in a secured container to your veterinarian. They can test the tick for the presence of disease. Many tick-spread illnesses can be treated, particularly if caught early, so by getting the tick tested, you can begin treatment and help your pet before it gets sick. There actually are very few tick-borne illnesses that occur in cats, but the ones that do can be serious. Cats can get Lyme disease just like dogs and humans can, and if treated early, should fully recover. There's no Lyme disease vaccine for cats, however. Another flea- and tick-borne illness in cats is feline infectious anemia. As with most varieties of anemia, it causes weakness and lethargy in cats. Treatment includes a course of antibiotics for several weeks. Perhaps the most common tick-borne ailment that affects cats is tularemia. Again, there's no vaccine for this in felines. A high fever and loss of appetite are the most common symptoms in cats. Tularemia also is treated with antibiotics. And finally, cytauxzoonosis is a serious tick-borne illness that affects cats. Symptoms include anemia, fever, jaundice and difficulty breathing. This is a very serious, potentially fatal infection, and even if a course of antibiotics and intravenous fluids are administered in time, the cat may still die from cytauxzoonosis. This is another tick-borne illness for which there is no preventive vaccine available to cats. You may have been advised to soak the tick on your cat with Vaseline, kerosene or alcohol, with the idea being that the tick will "back out". However, this does not work. The tick will simply burrow deeper into your cat, causing it to deposit even more toxins into the cat's tissues. While ticks can be dangerous, taking action right away and removing it safely can save your cat's life. After removing the tick and treating the affected area, monitor your cat's behavior, appetite and skin for a few weeks. If your cat is lethargic, loses his appetite or develops welts or rashes near the tick bite, he may have developed a disease from the tick and will require medical attention right away. Monitoring his condition and getting him to the vet as soon as possible can help minimize the impact of any illness.